AMC’s “Mad Men” is not only one of the best dramas on television, it also debuted with perfect timing, at a moment when America’s fascination with mid-century style was at a fever pitch. Three years later, as Season 4 premieres, the frenzy for furniture and fashion of the 1960s is still hot. In celebration of tonight’s episode, let’s take a look at the show’s immaculate, award-winning production design. Starting with Don Draper’s office. Set in the early 1960s, nearly every shot of “Mad Men” is filled with objects from an era rich with new ideas, a time when modernism was still fresh, yet more mature than its early years — on the brink of going mainstream. We wanted to make sure it wasn’t a textbook study of mid-century modern America — as Matt specifically pointed out, look around your own house, does everything exist from 2007 or do you actually have stuff lying around from the ’80s? … there are a lot of things that are holdovers, especially for the older generation. Their cars could be from the early ’50s. You have to watch out for the misinterpretations and prejudices you might have about the era. It’s also very easy to try to jam everything that was introduced in 1960 all into one episode. You have to space it out a little bit. ’Cause everything that was developed in 1960 didn’t happen in one day. We also don’t want to create a historical anachronism by putting a 1962 typewriter or transistor radio in, so we try to watch that, unless, creatively we just decide it’s a good way to go. Otherwise, we keep ourselves locked to April of 1960. Set decorator Amy Wells was responsible for the decor. Many of the pieces are originals, like the Eames Executive Chair (see it at DWR), others are reproductions. Wells was featured on NPR’s All Things Considered in anticipation of the Season Three premiere. Wells, oddly enough, is one of the few people on the Mad Men staff old enough to remember the era the show depicts. But she doesn’t just rely on her memories when she’s decorating a kitchen or a swanky office; she’s got a vast library of vintage catalogs and decorating books. Wells also revealed in the NPR interview her budget: $25,000 per week/episode. I imagine that’s increased since last season. Don’s office was gently remodeled between the pilot and subsequent episodes. 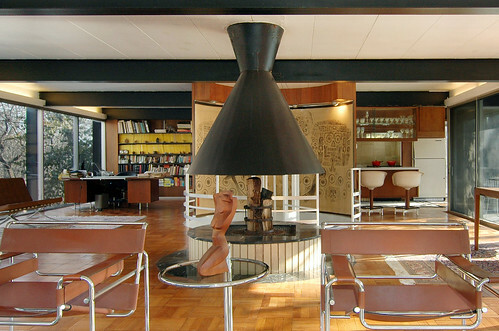 The simple leather chairs were replaced with cane-back pieces (possibly Hvidt/Mølgaard-Nielsen), and the desk lamp went from Bauhaus to ’50s twin. Don’s all-teak Danish modern desk from the pilot was a beauty with its backside display shelf (lonely and bare) but it was replaced with something that was much more common in an American office at the time: a larger Knoll or Steelcase, with metal legs and an overhanging surface. The drab walls of the pilot office get the biggest upgrade: rich wood paneling. Dan Bishop says in a special feature of the Season 1 DVD that the panels are real walnut (stained in the typical way), but creator Matthew Weiner thought it as too cold, so they added a red dye. The lounge area of Don’s office is anchored by a Boxy sofa, armchair, and coffee table from Futurama, a Los Angeles shop that reproduces vintage designs. (Thanks to Javi!) The Futurama sofas are manufactured by Simplaform and are inspired by Jydsk Møbelværk and Milo Baughman. If you like this look, don’t forget Autoban’s Box and Herman Miller’s Goetz. And oh, that steel ashtray on a pedestal … the roulette cigarette dispenser … they make even non-smokers dream about decorating their pads with smoking accessories. What sort of desk will Don Draper grace in the new agency? Maybe we’ll find out tonight. In the meantime, the Mid-Century Modernist “Mad Men” Furniture series will continue. In the next installment we’ll step outside Don’s nest and explore the rest of Sterling Cooper’s former offices and the new digs of Season 4’s Sterling Cooper Draper Price. Well, all the attention to the furnishings, etc. is nice. But what really is jarring to my eye is the totally out of place ceiling. The acoustic tiles, fluorescent fixtures and and air vents are way, way too current. All the office sets strike my as phony against the omnipresent ceiling and related fixture. I am very surprised this seems to have not been caught by now. It doesn’t look great, true, but I’m not sure it’s historically inaccurate. Drop ceilings were invented in 1958 and were common by the early 1960s, no? Hi Mike. Yep, we’re definitely doing a Sterling Cooper, before/after. mad man is selling some a couple of pieces at ebay. 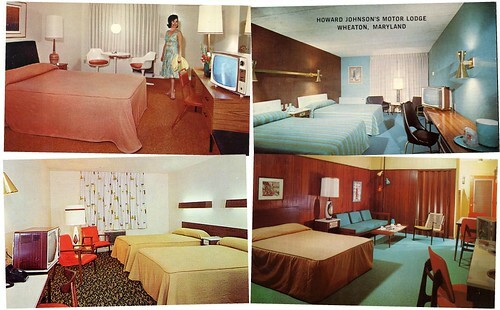 I absolutely love the furniture on Mad Men, thank you for featuring the furniture and set designers on your site. I am very interested in a reproduction of the coffee table in Don’s office in Season 4, Episode 7. I see from your site some of the furniture is custom made and auctioned on ebay. Can you tell me if this particular table is an existing available for purchase? Don’s desk. Haven’t watched in a while :( , but I have the silver ashtray with the birds with open beaks on my coffee table. Thought it might be an ashtray, thanks for answering that. A flat black and gold globe was on Don Draper’s Desk. It has a window that displays a number to correspond with the day’s date. To change the number you flip the globe. My wife has an exact piece that was given to her Grandfather by a car dealership. It has only his name and the name of the dealership that gave it to him. We would appreciate some history as the piece has no name of manufacturer date or any other identification. All searches have been of no help. We were watching an episode from the second season and eerily Don’s flat globe was on 5 so was ours, January 5, 2010. While the office look was quite good, the Drapers kitchen was a bit too off. That 1948/49 GE refrigerator was way to old for them, It made no sense to have a pale yellow wall oven that DIDN’T match the frige or the electric cook top. Another thing that was way, way off was the alleged “bad” television reception, I mean really, I remember the day before cable, and most channel’s came in crystal clear. Specially if you lived in the NYC metropolitan area where most channels transmitted from the Empire state building. So PLEASE drop the fake horizontal/vertical and snow bit. Any idea what those “simple leather” chairs are that were swapped out for the cane ones? They show up later in Roger’s office. I’m asking because I totally got one at a garage sale for $11 and I’m refinishing it. I’d like to know more about it, so that I can get the finish right! We bought two boomerang chairs from Futurama and haven’t looked back. Ordered and delivered in 6 weeks, made in USA. Great quality! I noticed an interesting similarity between the wallpaper in The Americans and the wallpaper in Mad Men.